Quietest and least visited of the Southern hill stations and most charming for it. Plantations and tea gardens and surrounded by reserves. Far from the madding crowd and easily accessible from Trivandrum. 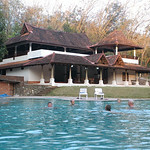 It is located 61 km from Thiruvananthapuram city and 915 m above sea level. 22 hairpin bends en-route, each uncovering spectacular vistas, give enough excitement. The cool, green, forest environs surmount the excitement. Exotic butterflies, beautiful mountain flowers, tiny rivulets and springs and the deer park close-by make Ponmudi excellent hill resort. Easy trekking in the area around amplifies hill-amusement. It serves as an ideal base for visits to the Peppara wildlife sanctuary, which is a haven for elephants, lion tailed macaques and leopards among others. You need to trek for 1 km through jungle to enjoy this pristine waterfall, but you have earned the pleasure and the dip into the cool water is heaven. Lovely hilly road with good surface that winds around hills with lots of places to stop and start and enjoy. Stop at Golden Valley for waterfalls and count the 22 hairpin bends. Duke's Forest Lodge is perched on the edge of a 130 acre rubber plantation (Riverside Estate) in Anappara, fringing the Pepara Wildlife Sanctuary - which is a habitat for a wide variety of endangered flora and fauna in Southern Kerala.